(August 20, 2016) — Caring Clowns International today released a new video which explains the far-reaching impact the organization has had worldwide since its founding in 2002. “There have been so many touching moments with both children and adults in so many countries it wasn’t easy to decide which clips to include,” said Jed Duffy Selter President of the Board and Acting Executive Director of the organization. The video which is posted on YouTube can be accessed by going to www.caringclownsinternational.org and clicking on the “About us” tab. Through moving words, video clips and photos, the new presentation conveys the organization’s international reach and its primary objective to free the ‘inner kid” in children and adults alike. As humanitarians, Caring Clowns International funds life changing improvements for children in need. 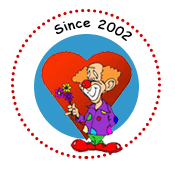 Caring Clowns International is an all-volunteer, IRS tax-exempt 501(c)(3) charitable nonprofit organization comprised of clowns across the U.S. and several other countries. These clowns donate their time at over 80 events internationally and across the U.S. including orphanages, children’s and other hospitals, events for homeless children and adults, residences for abused women and children, schools for the disabled, retirement centers, VA hospitals, events for kids with down syndrome and disabilities, and children whose parents are in prisons and correctional facilities, community events and private parties. “We hope that everyone who views the video is impacted and understands the emotional connection our clowns are making around the world, “ Selter said. Members have clowned and supported nonprofits operating in Afghanistan, Angola, Bangladesh, Bolivia, Brazil, Canada, the Caribbean, the Dominican Republic, England, Ethiopia, France, Guatemala, Hong Kong, Italy, Kenya, Mexico, Nepal, Peru, Russia, Sierra Leone, South Africa, South Korea, Thailand, Uganda, the Ukraine, Vietnam, and throughout the United States. Thousands of children and adults have received red clown noses, balloon sculptures, toys and stuffed animals. The organization’s goal is to raise and responsibly donate $5,000,000 to help needy children in the world. To date, Caring Clowns International has donated over $302,000 in funds and equipment supporting many nonprofits in the U.S. and developing countries.